There have been many films about slavery and the Civil War over the years. Only a couple have been good, and those have featured a big war in the storyline. But as far as a story strictly on slavery goes, the film count doesn’t have a lot of marks for great movies. With the exception of Quentin Tarantino’s ‘Django Unchained’, which was more a fantasy and revenge flick on slavery, british director Steve McQueen’s ’12 Years A Slave’ is a phenomenal film from top to bottom, yet it’s extremely rough to watch in certain parts due to the emotional content of the story. 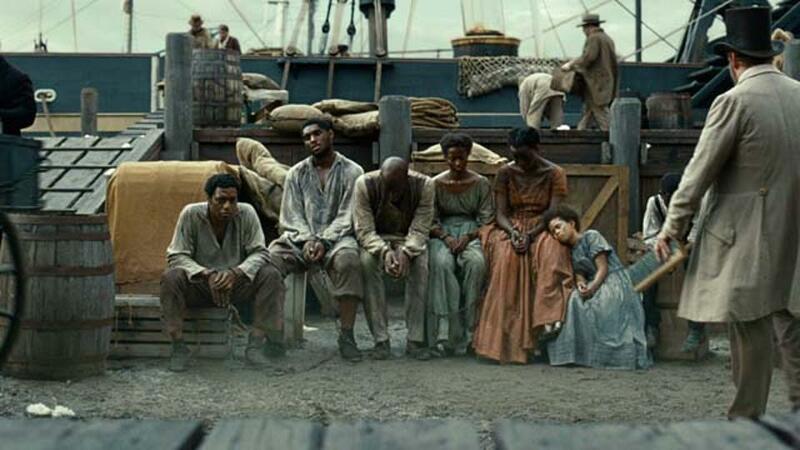 Chiwetel Ejiofor leads an all-star cast in one of the finest films in recent memory. One we won’t soon forget and will discuss with friends, families, strangers, and others for months to come. Ejiofor plays Solomon Northup, a real life free black man who lived with his family in New York in 1841. He lived in a good neighborhood, in a good house, and was well respected in the community, whites and blacks alike. Solomon plays the violin very well and is highly educated. However, one day, a pair of white men take him to dinner and offer him a job for a few weeks for good pay. The guys drug him and Solomon wakes up in chains and is on a boat on his way to the South, particularly Louisiana, where he is sold into slavery for twelve years before his amazing rescue back to his family. Northup actually wrote a book detailing his experiences as a slave and is still selling copies today. Once Solomon arrives in Louisiana, nobody will believe who he says he is and is renamed Platt by a slave trader (Paul Giamatti), who in then takes him and several other slaves to be sold. This scene is particularly rough to watch as we see Giamatti use these humans as products more than people to sell to his buyers. And when he separates children from their mothers, it particularly emotional. Several of the slaves including Northup/Platt are sold to a plantation owner named Ford (Benedict Cumberbatch), who takes a liking to Northup’s violin playing and higher education. Ford actually seems like a good guy, but was put in the wrong time period and the wrong place, as he doesn’t seem to enjoy the idea of slavery nor does he beat any of them. That can’t be said for one of his underlings, Tibeats (Paul Dano), who is quite the opposite and enjoys punishing and abusing these slaves. He pushes Northup to far one time, which causes Northup to beat up Tibeats. And Ford fearing that Tibeats will retaliate harshly, sells Northup to cotton plantation owner Edwin Epps (Michael Fassbender). Until now, Northup seems to be doing the best he can to stay alive and plays the helpless victim very well. But it isn’t until Northup arrives on Epps plantation, to where things get even better film wise. Epps is in fact a real person and even read Northup’s book. But Epps is truly an evil man, and not a one-note evil, but layers of it. Fassbender, who was the star in McQueens previous films, is indeed amazing once again here, if not on a grander scale. Epps’ belief is that he can void any thought from his slaves, no matter what they might be in the form of physical harm. But he also reads scripture to his slaves on Sundays, and has them dance in his house for him. However, his marriage is constantly on the rocks with his wife (Sarah Paulson), woh belittles him in front of the slaves on how he is not a real man, and how he drinks to0 much, which he does, and it doesn’t bode well for anyone, especially the small slave girl named Patsey (Lupita Nyong’o), who is raped repeatedly and beaten by Epps and his wife. 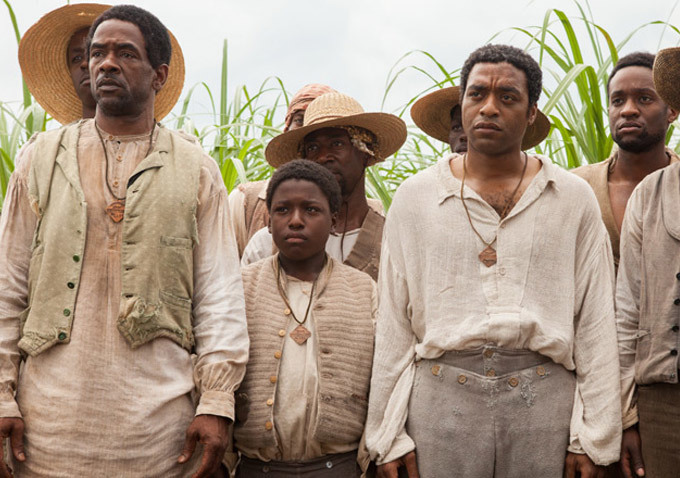 Towards the end, Epps hires a contractor to build a small gazebo on the plantation by the name of Samuel Bass (Brad Pitt), who is from Canada, and might just be the only way for Northup to escape from slavery as Bass doesn’t believe in this slavery nonsense and will even argue with his employer. There are many scenes of difficult watch moments, which include Northup’s near death, lashings that show bone on several slaves, and brutal hangings that befall some poor individuals. The routines of the slaves is captured here and it is truly horrific. Even though this story about this particular man has a happy ending, this was not the case with most others. The outpour of emotion from the final scene as Northup looks upon his now older family and out into the open land will leave you in tears and take your breath away as Ejifor seems to go through all of his emotions with his two eyes. It’s amazing. The performances by everyone are at the highest level here with Ejiofor and Fassbender sticking out as the cream of the crop. For Ejiofor showing that he is never giving up and wanting to escape, but never says it, is truly remarkable. And McQueen’s direction will surely earn him an Oscar nod for this is the most beautifully shot film on slavery ever made. ‘12 Years A Slave‘ receives my highest recommendation. Fernando’s Review of ’12 Years A Slave’!! This entry was posted on Thursday, October 24th, 2013 at 8:42 pm	and is filed under Film, News. You can follow any responses to this entry through the RSS 2.0 feed. You can skip to the end and leave a response. Pinging is currently not allowed. « Fernando’s Review of ’12 Years A Slave’!! [being pulled up from the hotel balcony] Watch it, you fuckhead! You're gonna pull my arm out!